Ahmed was a graduate of Cairo University in Egypt (1976), with post-graduate work in history and a Masters in Archaeology (1978). 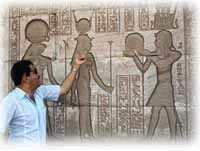 In addition to being an internationally known guide and teacher at the College of Tourism at Cairo University, he did archaeological work with Johns Hopkins University, Wheaton College (Illinois) and the Egyptian Antiquities Organization. For five generations the Fayed family has been responsible for all the excavations at the Giza Pyramids and the Memphis/Sakkara areas. He grew up within yards of the Sphinx and lived approximately 200 yards from the Sphinx. 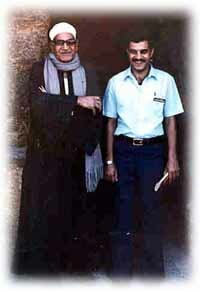 Fluent in four languages (English, Arabic, German and French), Ahmed lectured throughout the world and interviewed on television and radio programs about ancient Egypt. He was considered to be the top guide in Egypt (Educated Traveler Magazine 3/95), and escorted various groups, celebrities and royalty throughout the country. The New York Times called him "The busiest guide specializing in the metaphysical field." Ahmed was closely affiliated with the Association for Research and Enlightenment (the Edgar Cayce organization). He has been the guide for the Coptic Fellowship International, Wreckin Trust, Arcanea, Queen of Cups, Aromatherapy and Aurosoma Groups. He was the personal guide to well known individuals, some of these noted personalities are; Henry Kissinger, Elizabeth Taylor, Princess Diana, Leo Buscaglia, Pat Robertson, The Grateful Dead, Mrs. Jahan Sadat, Shirley MacLaine, Sally Jessy Raphael and Ken Kesey.